South Africa houses more than the 11 major languages spoken here, but English is the prescribed universal for teaching and testing within the faltering educational system. In the Western Cape, a vast majority of our learners are native isiXhosa speakers – English is their 1st or even 2nd Additional Language course manadatory for all high school students. Speaking English is one thing; a non-native speaker can communicate in broken English their meaning well enough in rudementary form. Instructors are mandated to teach their lessons in English, but this is not always the case in township schools where learners are already struggling with initial concepts in all subjects, compounded by the struggle to translate from English to their native language. Solution? Stop teaching as frequently in English. Yet there’s a few problems with this: homework assignments for all classes are given in English; textbooks are written in English; exams are written in English. When I first joined IkamvaYouth as an intern and tutor, I quickly realised that our learners were struggling to answer questions dealing with analysis simply because they didn’t know what the question was asking them. Their low reading comprehension skills and basic lack of knowledge on how to use referencing materials became overwhelming. Our learners can speak English because it’s in the music they listen to, the television they watch, and they use it with those from outside of their communities. But can non-native English-speaking South Africans read and write English to the proficiency standards set by National exams? Simply, the answer is no. The English Reading Project at IkamvaYouth is set out to address this issue. On Saturdays I work soley with grade 9 learners to help them understand the fundamentals of the English language: grammar and sentence structure. I know, it makes even the strongest of hearts cringe at the thought. Almost every week my learners spend about 15 minutes writing on a topic of my choosing. The next week, their papers are returned with corrections to punctuation, spelling, and grammar notated as well as feedback. The rest of the class period is spent learning about different parts of speech, what their roles are in sentence structure, and grammar rules associated with the many irregularities that come with writing in the English language. Reference materials such as the dictionary and encyclopedia are also introduced and encouraged for learners to use. From where we started at the beginning of the year, the results seen in their writing are astounding, and it makes me excited to see how this carries on with them through their exams and onwards to matrics. When I first saw the Ikamva advertisement, I thought of being helped through everything I didnt know or understand. I was very happy, without lying, because it was an honour to see/understand that there are still people who care about us people who need their help. Ikamva’s people improved my marks at school; now I can write or spell words correctly in a good way. Also, now I somehow know how to do maths, use the computer, and I have developed through learning here. It’s very fun too, because you get to go to places you never thought you would go to, meet new people and learn about who they are, and so on. This is me, Thabo, as the face of IkamvaYouth. This is where I belong. This is where you build up education and your future. I heard people speaking about this program. I thought I should try what they are trying and bring myself to IkamvaYouth to be one of the members that work very hard for their future. So for me being here is a success, and I still want to be here since Ikamva has now become a family to me. I respect what I am doing at IkamvaYouth. Let me give you advice: If you have a goal in your life, just go for it and it will be a success. Success starts now – not tomorrow, now. So guys, I am aiming at something big with my life, and I want it to be a success. If I fight for it, it will happen, I can feel it. It is here. From IkamvaYouth, I learned how to work with other people and how to communicate with them. It has been a great experiment for me, and it’s also helping me with my school work or my assignments. It wasn’t my thing to come to the library during the week and Saturdays, it’s boosting me to do my school work regularly. I’m glad that I received a great opportunity to attend classes here. It’s really helping me with my assignments and my school marks are improving as well. Makhaza Now Has a Digital Register! After years of taking our attendance manually, our beloved Mr. Kota has created a database to scan our learners’ student badges and display their information and attendance every time they show up for homework and tutoring sessions. See video demonstration below. As such, we only have this database running for our Makhaza branch. We are currently looking for a Web Developer who can help us to get this program online so that we can share this knowledge with our other branches across the country. On the road to Clan William, we were taught different types of mountains and how old they are. We were taught about rocks, how to make cement, and different factories along Malmesbury. On our way to Clan William there were also rivers, and it was the geologist who taught us these things and the rivers’ names. There was always time for everything, and we went to a restaurant for lunch. After we arrived at the place where we were staying, we just took a few minutes break and hit the road again. We went to a forest where San people lived a long time ago. Our tour guide showed us places where the San people wrote; they did not have pens and papers like us, so they wrote on rocks, even if they had experienced something new. We were taught about different kinds of paint they used. We were taught different kinds of animals that lived in that particular area and where they have ended up today. We took pictures of that place. It was a two hour trip. We were all tired and we all wanted to take a lift down the mountain. When we were going up there, we did not want to take a lift because we had energy and we all wanted to experience our trip. After that we went back to our rooms tired, and some of us took a bath. At about seven o’clock, we had a full supper, drinks, and biscuits. Then we went to our rooms to relax, and they brought us chips and sweets. After everyone relaxed, we went outside and played games. 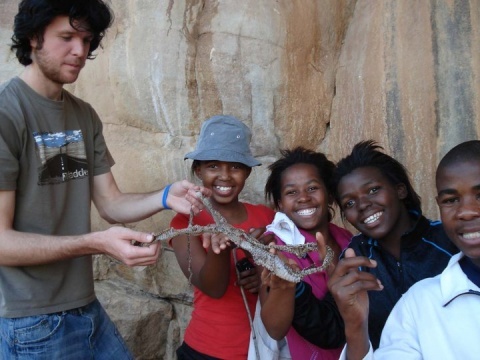 There were not only Ikamva learners, there were also UCT (University of Cape Town) students and a Geologist. They came up with new games we did not know, and we also gave them games they did not know. We had a lot of fun there. In the morning after finishing everything, we went to a hotel for breakfast. Most of us did not want to go becasue we were still having fun. We had acknowledged a great experience. Even on our way back we did not come back the way we went, and we got to see other mountains and rivers. Above picture: Lorna (second from left) holding a reptile’s skin with her peers. On 22nd May 2010, IkamvaYouth in Makhaza hosted an HIV/AIDS awareness activity in which New Start and Youth AIDS offered their services to our learners and the community. Youth AIDS is an organisation targeting youth in and out of school in the age group between 16-24 years old. This time around they came to introduce themselves to the learners saying, “We are going to work with you fully and well-equipped during the Holiday Programme.” They are really enthusiastic to work with our learners. On the other hand, New Start is an organisation that does voluntary counselling and testing while targeting all age groups. They arrived around half past ten in the morning and set up their apparatuses. While tutoring was in continuing, the voluntary counselling and the testing was rolling outside offering their services to the community members from around Makhaza and the tutors who were not engaged at the moment. After tutoring many of our learners joined the queue, and I must say it was amazing to see our learners brave enough to test in large numbers. This was a very successful day for HIV Awarness and testing for our learners. IkamvaYouth is proud to announce the publication of our 2009 Annual Report. There are many others (too many to mention), who helped with writing, editing and getting content, and we applaud each of you for your contributions! IIkamvaYouth‘s sixth year was a big, busy one. We grew (expanded our team and our reach) and most importantly we once again, against all odds, achieved our mission: an 87% matric pass rate (54% Bachelor passes and 31% Diploma passes, required for access into tertiary study). Our learners far surpassed the national and provincial matric results; compared with those of the districts in which we operate, they are astounding. These results (together with mentoring and career guidance) enable our learners to matriculate from township schools, walk through the doors of higher education and realise their dreams. It is wonderfully fulfilling to be delivering on our mission in a way that far exceeds any realistic expectations. There are Ikamvanites in fields including Biochemistry, Information Technology, Business Administration, Psychology, Engineering, Education, Nursing and Law. Some are traveling the world, others have enriching jobs, or even running their own small businesses. Many ex-learners are still spending every Saturday morning at Ikamva as volunteers. Anna Telford‘s documentary, IkamvaYouth Flying Colours (2009) captures some of these stories. Watch it now! we do, and in 2009 they helped us to be bigger, better and in new places. Read all about these exciting new developments in the branch directors‘ reports. Sharing resources, expertise, and lessons learned is key for the success and replication of our model. Read about IkamvaYouth- in-a-Box and our plans for 2010 and beyond to find out about where we plan to go from here. I‘m inviting all readers of our 2009 Annual Report to join the learning revolution. Bring your time, talents, skills, cash or resources and invest in our future. Viva, ikamvanites, viva!